Neighbors and an Upper West Side preservation group have filed a zoning challenge against Extell Development’s residential tower at 36 West 66th Street. The protesters claim that Extell is using zoning loopholes to get a taller development and better views for their future tenants. The challenge, submitted to the Department of Buildings on September 9 by planning consultant George Janes, asserts that the luxury developer has erroneously drafted a 161-feet mechanical void space that starts at the 18th floor. It claims that the areas Extell has allocated for mechanical exemptions to the zoning floor area are not proportionate to the actual mechanical use. According to Janes, there are also unanswered questions regarding the safety of interbuilding voids and how the FDNY could access the mechanical voids, elevator shafts and egress stairs in the event of an emergency. “It is remarkable that a developer can come into a community, disregard the letter and intention of an existing zoning resolution, and exploit loopholes that its elected officials and city agencies like the Department of City Planning and FDNY find egregious and possibly unsafe,” said Chris Giordano, president of the local block association. 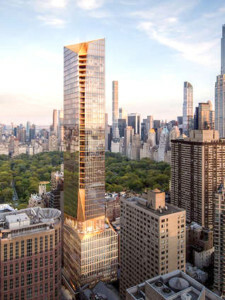 Extell’s development, also known as 50 West 66th Street, is a 41-story apartment tower designed by Snohetta Architects that is expected to rise to 775 ft, making it the tallest on the Upper West Side. Members of the local block association and preservation groups such as Landmark West! have opposed the project claiming it’s too tall to match the context of the neighborhood. Extell was not available for comment during the Jewish New Year, but the developer wouldn’t be the first to use design elements such as creating large mechanical rooms, including hollow structural voids or even building atop stilts, that don’t count towards the building’s FAR (Floor Area ratio) or maximum square footage limits. 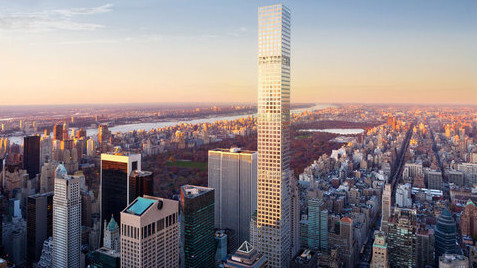 The city’s tallest residential building at 432 Park Avenue is one of the most visible examples of developers using design elements that help raise their height. In the Rafael Vinoly-designed building, there are several two-story mechanical structural voids every several floors that are meant to help stabilize the skinny tower and contribute to its slender design. In another Vinoly-designed building on the Upper East Side, the architect employed the use of a structural core and upper floor mechanical rooms to achieve greater heights. The 510 ft. high residential condo at 249 East 62nd Street offers 83 units between 32 stories. But the design details a townhouse and retail space at the base of the building, mechanical space from the 13th to 16th floors and on the top three floors. DCP said it should have policy recommendations ready by the end of the year.